Making firewood is easier, faster and safer with the appropriate machine for the job. What this means for us is constant product development, in which every minor detail of the machine is thought out and tested with extreme care. This results in a high performance device that can be supplemented with diverse accessories, as necessary. Japa firewood processors are designed and manufactured in Finland with decades of experience. The durable high-quality parts ensure the reliable operation that has come to be valued by professionals. Our product range features the perfect solution for all needs. This is our area of expertise. Therefore, we know that you will be happy with your Japa firewood processor. Japa® 315 is an excellent choice for shared use or part-time contract work. 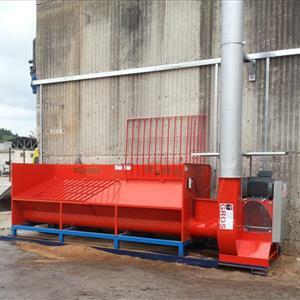 The processor is equipped with a log feed and splitting mechanism that minimises pusher movements. This makes cutting logs faster, shorter logs, in particular. The new pusher design facilitates the splitting of all log sizes,and the new blade is easier to use and adjust. Japa® 315 has a reinforced log gripper and full-length input belt, which make it faster, easier and safer to operate. The upgraded, adjustable log length stop is retracted during sawing, allowing the log to fall freely into the splitting channel. Japa® 315 offers extensive features and high capacity in a compact, mobile unit. We increased its capacity – the maximum log diameter is now 31 cm and length 50 cm. Reliability, user comfort and safety were our priorities when designing this model. The re-designed Japa® 315 meets all the current safety standards, and its active safety guards improve visibility inside the machine, making it easier to use. All the guards have been designed so as to ensure maximum visibility inside the processor, which makes, for example, maintaining the blade easy. Choose the accessories you need from the extensive Japa® 315 range. Accessories include a log lift, mechanic turning of the output conveyor, sawdust bag holder and six-way splitting knife.We only use the best components on the market in our Japa® firewood processors. Available motor types are combustion engine and electric motor. The Road models also feature a folding lightpanel, which further speeds up the setting up of the machine for operation and transport. The Road models are also available without vehicle inspection equipment, in case the machine will not be transported on public roads. Tractor hydraulics Oil Flow 30 l.p.m n.a. n.a. n.a. Tractor PTO n.a. 400 r/min n.a. n.a. Electric motor, 4.0 kW 415V n.a. n.a. Standard n.a.